The Class IV Deep Tissue Laser is the most advanced laser available, delivering fast and effective, long lasting relief for a wide variety of issues. 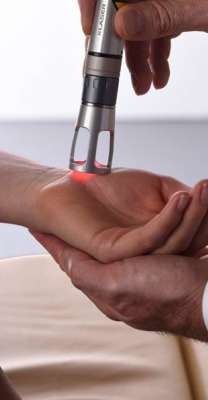 Laser therapy uses specific wavelengths of light to create optimal therapeutic effects which improve healing time, reduce pain, increase circulation and decrease swelling. During laser therapy, the infrared laser light interacts with tissues at the cellular level, increasing metabolic activity and circulation while improving the transport of nutrients to the damaged area. Used effectively in Europe since the ‘70’s, laser therapy is now used extensively in the United States since its FDA clearance in 2002. The Class IV Deep Tissue Laser has been an important part of the treatment program at Regional Rehab since 2008. To date, we have performed over 50,000 laser sessions, providing drug free, surgery free, safe and non-invasive therapy with dramatic results.